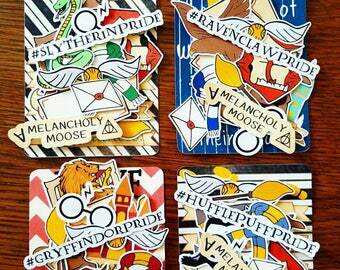 Show off your Hogwarts House pride with these hand-drawn Harry Potter inspired planner stickers! A spin off from my Erin Condren sized weekly kits, these kits have been adapted to fit well in a Bullet Journal, personal size planner or any planner you want to use them in! The kiss cut stickers are small in size and will fit easily in any planner you use. 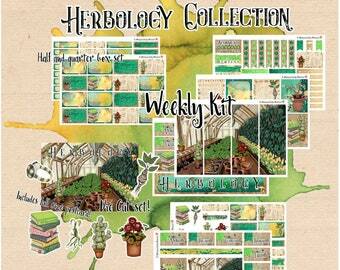 I've designed these kits to be multi-functional so that you can use them for a monthly layout, weekly spread or as added decoration through out your planner. -Over 30 decorative stickers. Boxes, banners and labels for making lists, reminders and organizing in style! -8 sets of hydration trackers. -A set of adaptable date covers and 31 numbered flags. 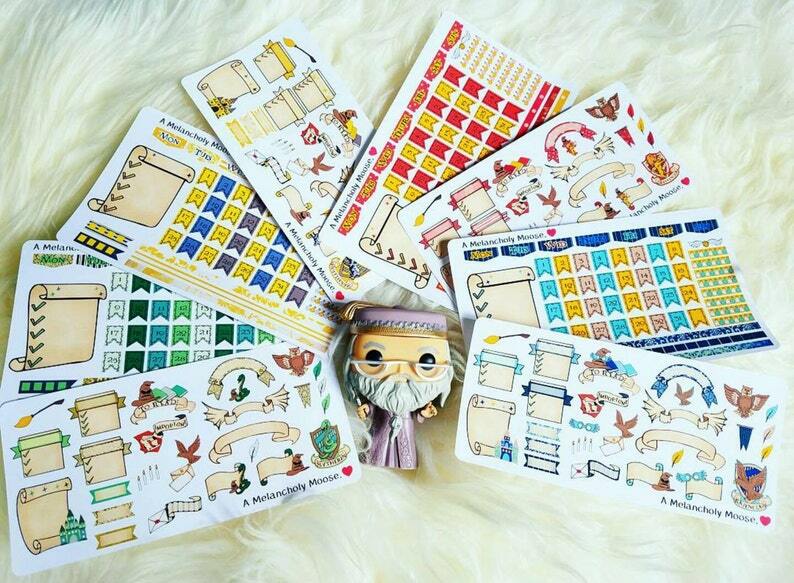 Stickers are printed on matte, non removable sticker paper. Please keep in mind that colors can vary due to differences in computer monitors. *Thank you so much for looking and don't forget to follow me on Instagram @amelancholymoose for updates, layout examples, new releases and coupon codes! 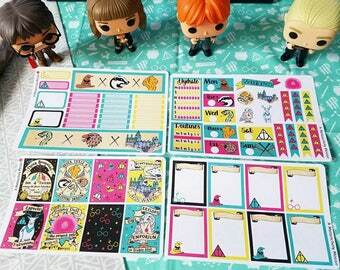 Wizarding World- Hand Drawn Inspired Die Cuts for Planners, Traveler's Notebooks, Scrapbooking & More! 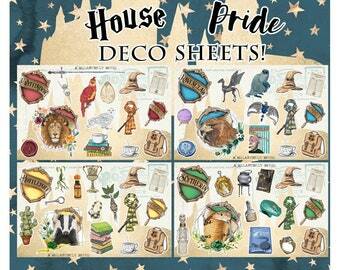 Hand Drawn Wizard House Inspired Die Cuts (Choose your house) for Planners, Travelers Notebooks, Scrapbooking & more! 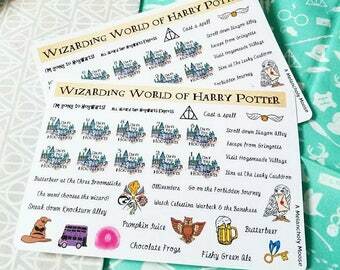 Wizarding World Inspired Sampler- decorative planner stickers for Erin Condren Planners, Happy Planners, Filofax, Bullet Journals & more! Items as described and good quality. I ship with in the US and Internationally. If your country isn't listed, please message me and I'll happily add it! All international orders ship for a flat rate, which means the cost will not go up, no matter the amount you purchase. Domestic orders currently ship FREE to the customer. Because of this, orders under $35 do not ship with tracking. All international orders will ship with tracking provided. All orders ship via USPS First Class & First Class International mail. Processing time is currently 1-3 weeks. This time is subject to change during periods of increased volume of orders. All items are drawn, designed, hand printed, cut and packaged by me. I strive to do my absolute best to get your stickers out to you in an acceptable time frame. Every order is printed, cut and packaged solely by me. I try to put as much love and thought into creating your order as I possibly can! I keep my packaging a bit minimalist so I can offer you more of my actual product. All orders come with a large free sampler, that changes frequently, because I would rather send you more stickers than frills! Your order will arrive in a (waterproof) reusable clear storage bag, wrapped in a card stock folder and packaged in either a sturdy mailer or envelope to ensure it's safety during the journey to you! 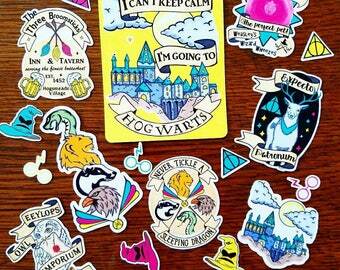 Magical Nifflers Collection~ hand drawn stickers for planners, journals and more! 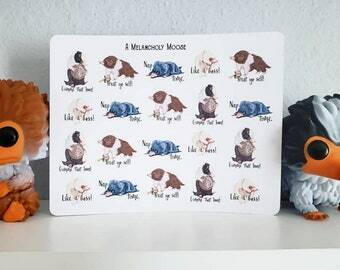 Niffler Icon Stickers- hand drawn stickers for planners, journals and more! Hermione Sampler~ inspired, hand drawn decorational + quote stickers for Planners!